Private equity firms taking numerous companies private narrowed the playing field in AETHOS Consulting Group’s study of corporate governance in the lodging industry. Interestingly, many of those same PE firms are taking other portfolio companies back to the public markets this year (Hilton, LQ, Extended Stay). In our 15th annual study of US board performance, Host Hotels & Resorts and Starwood Hotels & Resorts tie for first place. Host rose from its 7th place ranking and Starwood from 4th in last year’s study, edging past Sunstone Hotel Investors, last year’s winner. The survey includes 26 companies this year, a substantial drop from last year’s 33, reflecting some transitions in the industry including the acquisition of Great Wolf by Apollo, and Apple Six REIT by Blackstone Group. The principals at AETHOS Consulting Group have been evaluating corporate governance practices in public lodging companies for over a decade, examining board makeup, independence, committee structure and commitment to pay-for-performance. With more awareness across all industries about the importance of diversity at the board level, AETHOS has modified its evaluation model to include points that reflect commitment to diversity within the “size and makeup” category. View complete findings of the survey and the philosophy behind the allocation of points here. What is striking this year is that many companies made big improvements in their board structures. For example, 60% of our survey group had an odd number of directors ranging between 5 and 11; a significant improvement over last year’s 39%. The number of Chairman/CEO combinations remained steady at 30%, with a slight increase in the percentage of “insider” Chairmen. In a positive response, there was an increase in the percentage of designated “lead” independent directors (a new SEC recommendation). It also appears that fewer insiders are sitting on boards as 65% of our survey group had fewer than 25% insiders. Perhaps the message here is, familiarity with the company is important at the highest levels of board leadership, but it must be coupled with a greater measure of independence across the rest of the board. Term length continues to move closer to the best practice of one year. Fewer companies are getting away with having staggered three year terms. Investors are demanding that all directors stand for reelection at annual meetings. We added a measure of “commitment to diversity” in this year’s study where boards were evaluated on their formal policy regarding gender and racial diversity, their implementation of the policy and the representation of gender and racial diversity on their board. Boards are required by the SEC to form the following four committees: Audit, Compensation, Governance and Nominating. 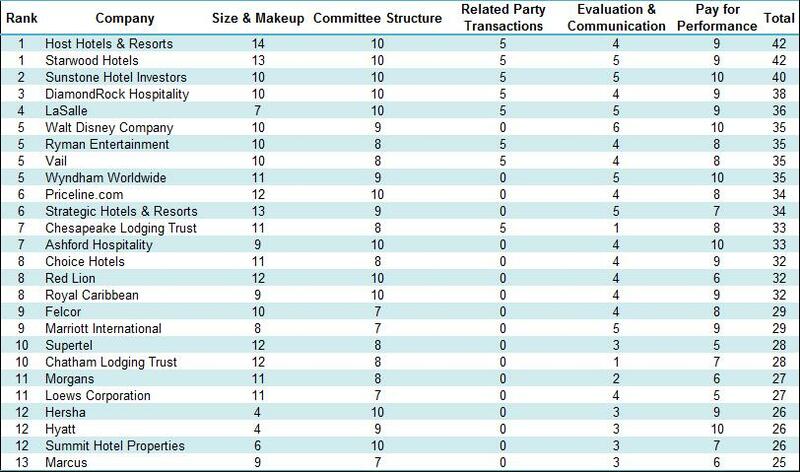 A larger number of companies achieved a perfect score for committee structure this year: 11 out of 26 versus last year’s 8 out of 33. Audit committees held the same average number of meetings this year, whereas, Compensation, and Nominating & Governance committees held slightly more meetings, on average. “Insider” participation on subcommittees has all but vanished from the lexicon of board structure. It seems that board directors are spending significantly more time and energy in dispensing their duties as fiduciaries of public companies. Transactions with related parties has decreased slightly over last year, even with the application of a more stringent rating system. This reflects a reaction to the increased scrutiny by watchdog organizations. While it’s difficult to eliminate related party transactions altogether, especially in the largest of companies, we are pleased to see the positive trend. Part of a strong governance policy is how a board operates internally, including self-evaluation and accessibility to shareholders. We added this category to our study last year and the levels of self-evaluation and communication remained the same compared with the prior year’s study at 3.8 points, on average, out of a possible 5. We expect the more boards will publish board evaluations and continue to improve their method and frequency of shareholder communications. This year, five companies achieved perfect scores in pay-for-performance, one more than in last year’s study. We see this as a positive sign and a reflection of the increased public and watchdog pressure for more transparency and alignment in executive compensation. A push for transparency around certain policies such as excise tax gross-ups, claw back policies, stock ownership requirements and perquisites has required compensation committees to rethink corporate compensation philosophies. Lodging boards continue to improve their practices by applying more stringent performance measures and working to meet shareholder expectations. Host Hotels & Resorts and Starwood Hotels & Resorts’ tie for first place is a reflection of the drive towards improvement that corporate lodging boards continue to make. Congratulations to Richard E. Marriott, Chairman of Host Hotels & Resorts, and Bruce W. Duncan, Chairman of Starwood Hotels & Resorts, and their respective Boards of Directors, for their hard work and thoughtful achievements in the area of corporate governance.